This Week in Raiding… Razorblade Roller Coaster! I must say, this week was a bit of a roller coaster for the Razorblade Arcade raid team! Sunday night, we ventured in to Icecrown Citadel to finish clearing up the bosses we could. The plan was to make our way to Putricide, taking out Rotface on the way. Well, one of our raiders had forgotten about the raid… so we had to bring in some PUG DPS. This is the kind of PUG that I get mixed feelings about. He seemed to follow instructions fine, no blowing up the raid or anything… but simply was not pulling the numbers we were looking for. I felt bad for him. But we realized after an attempt at Putricide that he was doing half the DPS of the person he was temporarily filling in for, so it wasn’t a good idea to waste our valuable attempts. Instead, we headed to Blood Princes and took them out pretty quickly. I took up my post on Disco Ball duty (which is not nearly as fun as it sounds). I was pretty pleased – we managed to take out both Rotface and Blood Princes in a couple hours, when before they took entire nights of attempts to get down. Progress! Monday night we all hunkered down to push through and finally beat Putricide into the ground. Confidence was high and things were looking good – but alas, just two attempts in our Resto Shaman lost his connection, and we know from experience that meant he probably wouldn’t be back for the rest of the raid. It sucked, but we took advantage of it and did a Sarth 3d to get someone a mount, and 6-minute Maly to get some Glory of the Raider achievements. Unfortunately, the night was also spattered with some drama within the Officer class… but I won’t get in to that here. Wednesday, on the other hand, was a beautiful raid night. 7 bosses in less than 3 hours! Putricide took us just 4 attempts (including one where our Abomination tank disconnected at the start). I really don’t know what we were doing much differently from our previous attempts (in which we could barely get him below 70%) but we really hit the nail on the head this time! Sunday night we head in to hopefully take down the Blood Queen with our remaining 16 attempts and maybe even get a peek into the new wing! This Week in Raiding… is my weekly Saturday post where I allow myself to expatiate about new gear, bosses, achievements, and such. This week we had our first experience with the Plagueworks of Icecrown Citadel. I have to say, it’s a bit of a challenge. First, we have Frogger 2.0. A few torpid people in our raid even died to it… I won’t name names, to protect my their integrity. Then came the Valkyr mobs. And after getting overpowered by our own selves, we managed to take these mobs out by focusing on the Valkyrs instead of the ghosts. That seems to work most of the time. Onto the puppies, Precious and Stinky! It’s true that they’re almost mini-versions of Gluth from Naxxramas, even their abilities. It just goes to show you how much more difficult this place will be if they are using old bosses as trash! In the end, they weren’t very difficult. Although I think Precious should have a chance to drop that pretty red ribbon… that could be a fun little trinket. We first went in and had our way with Festergut. After only one wipe, we managed to get him down. It takes a bit of coordination but it certainly is manageable. Loot was dropped, and it was of the hunter loot variety. Yay! Things were swell. … And then came Rotface. Buttface is more like it! We’ve now spent several hours (about one and a half raid nights) fighting him, and still haven’t gotten him down. It was a bit demoralizing to see wipe after wipe and very little in the way of improvement… we really couldn’t even see where to improve. You see, the problem with that fight (at least using our initial strategy) is that it’s a difficult and interesting fight really only for the slime tank. The rest of us get to side step around the boss every 30 seconds or so, and maybe even kite a slime to the slime tank. That’s about it. After many, many hours of this, it gets a bit boring. Not to mention “Good news, everyone!” and “Great news, everyone!” being shouted into your ear repeatedly! For once, I was actually tempted to turn my game sounds off completely just to keep some piece of sanity! After a second night of wiping on Buttface, analyzing what was killing us and some good looks at videos and various slime-kiting strategies, we’ve managed to lock down on a new way to do it and we’re very confindent he’s going to be down for the count next week. Stay tuned! This Week in Raiding… Ghugh Heads to Naxxramas! Last night, I finally took the leap and joined a Naxx 10 PUG on my paladin. It was supposed to be a “badge run”, but it didn’t turn out that way… like most PUGs. I did realize that I’ve actually never pugged a raid before! (Other than OS10 +0 and VoA, of course.) I actually had a lot of fun, and it wasn’t as frustrating as I expected it to be. 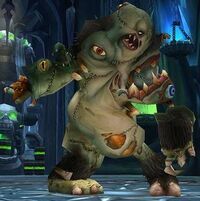 We breezed through Patchwerk, but unfortunately… Grobbulus didn’t go so smoothly, and we had to replace several people who follow the “Disconnect after 1 wipe” rule. Once we brought in some stronger DPS though, we managed to get through. I picked up 3 upgrades and 2 healing pieces (like I’m ever going to heal!) and made a new friend to PUG with on Dark Iron. Yay! But as far as badge run goes… It took us 5 and a half hours to make it through 3 wings, and by the time we started on Military, I was just too tired and antsy. I don’t like to play for more than about 4 hours, and I’d been online for nearly 8 hours straight… yikes! Didn’t help that Military is my least favourite wing, too. It would have been nice to see KT, but there is no way the group we had would be able to 1-shot 4 Horsemen, Sapph or Kel’thuzad, so it’d still take several additional hours… so I called it a night. Hoping to get more chances to raid on my paladin!